I knew I would enjoy this salad from one glance at the recipe's yummy ingredients! It's pretty easy to make too, with prep being three major parts: roasting the almonds, making the dressing, and prepping the salad. Mix it all together, and you've got a stunning and amazing first course sure to please. First, sliced almonds are tossed with olive oil and maple syrup and then roasted for about 20 minutes until golden brown and aromatic. Next, simply mix all the dressing ingredients: passion fruit nectar (oddly enough, I couldn't find this, so I used guava instead), olive oil, spicy Dijon mustard, sweet and tangy rice vinegar, pungent shallots, and a little black pepper. 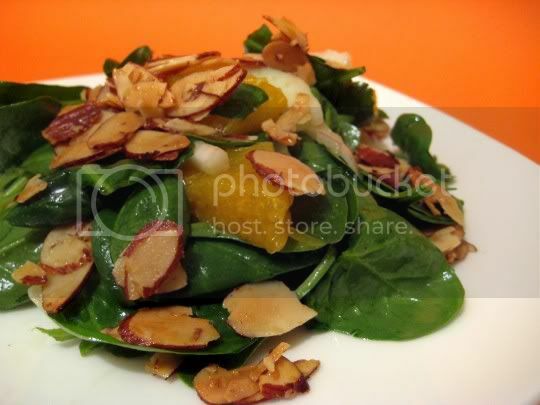 Finally, slice fennel and oranges, toss with the spinach and dressing, and sprinkle with the roasted almonds for a nice crunch. This was my first time tasting fennel, and I actually like it. It's mild, crisp, fresh, sweet, and has a very slight licorice taste (probably because that's what it is). Juicy oranges add bursts of sweetness, not to mention the tropical flavor of the dressing. Although I substituted guava for passion fruit, I think any tropical fruit would work here, even mango. Make again? Definitely. Light, fresh, sweet, and perfect for the summer (or whenever)! I even added a little Gorgonzola for that wonderful combination of sweet and savory. Blue cheese would probably be delicious too.